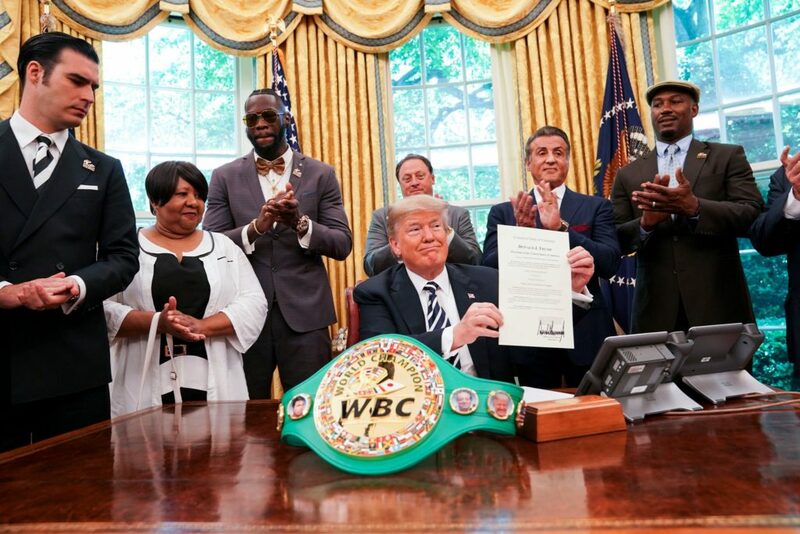 On May 24, 2018, in the office of President Donald J. Trump, the late heavyweight champion Jack Johnson received a full posthumous pardon. 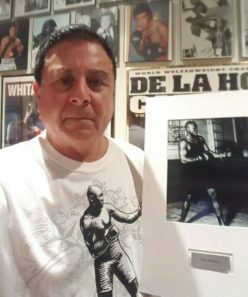 Attending the signing were World Boxing Council President Mauricio Sulaiman, former WBC/IBF/WBA heavyweight champion Lennox Lewis, current WBC heavyweight champion Deontay Wilder, and actor Sylvester Stallone, who was very instrumental in the entire process of the pardon. Johnson’s great-great niece, who attended the signing, had pressed for this pardon for many years, along with the support of Sen. John McCain (R-AZ), former Senate Democratic leader Harry Reed of Nevada, and former WBA/WBC/IBF heavyweight champion George Foreman. 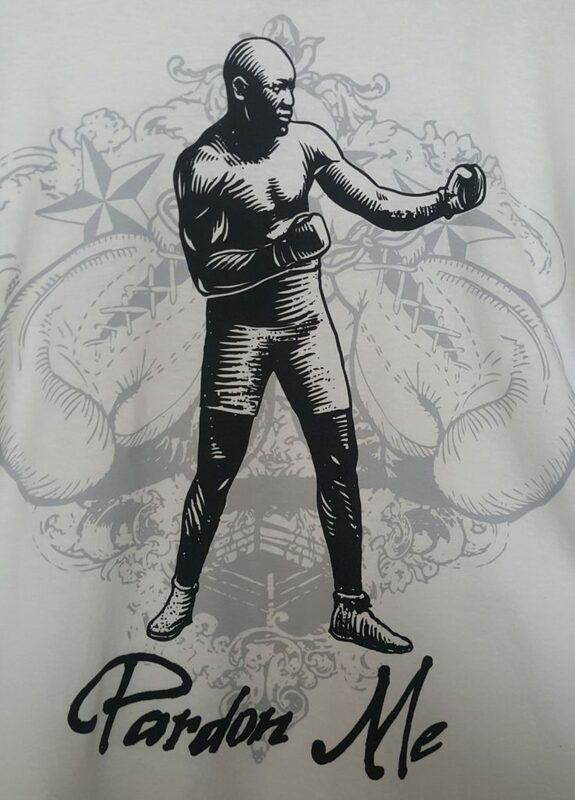 Jack Johnson was arguably one of the greatest boxers of all time and arguably one of the most despised African American sports figures of all time. 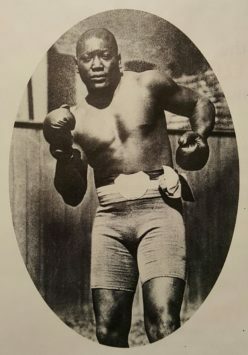 Johnson was the first black heavyweight champion, winning the title from Tommy Burns in 1908, at a time when blacks and whites rarely entered the ring together. On July 4, 1910 in Reno, Nevada, former undefeated heavyweight champion Jim Jeffries, who had retired in 1905, made a comeback in an attempt to regain the title from a black champion. This bout truly was “The Fight of the Century”! Johnson would beat Jeffries, and continued beating white opponents and flaunting his affection for white women, even fleeing the country after an all white jury convicted him of “immorality” for one of his relationships. In 1913 he was convicted of violating the Mann Act which made it illegal to transport women across state lines for “immoral” purposes. After seven years as a fugitive, Johnson returned to America and turned himself in. He was sentenced, served a year in federal prison, and was released in 1921. Now, a century later, Johnson’s great-great niece Linda E. Haywood, 61, is asking President Trump for a posthumous pardon. She has the backing of Senator John McCain (R-Arizona) who has fully supported this action since 2004. Haywood first pressed for the pardon back when President George W. Bush was in office. Her great-great uncle’s reputation has certainly left the family with undeserved shame and dishonor. Johnson was clearly treated unfairly, and convicted unfairly, for his choice of companions who were white. Personally, I support a pardon and hopefully this will be granted soon in respect for Jack Johnson and his family.